PetSmart has agreed to be acquired in a $8.7 billion deal. Woof woof! PetSmart has agreed to be acquired for $8.7 billion in the largest private equity deal so far this year. A group of investors led by BC Partners will pay $83 a share for PetSmart (PETM), a 39% premium from the company's stock price before it began exploring a possible sale early July, according to a company statement. "We are very pleased to add PetSmart to our portfolio of investments," said Raymond Svide of BC Partners. "PetSmart is an iconic brand and the category leader in the growing pet retail industry." The PetSmart buyout is the biggest private equity deal announced globally this year, beating out Blackstone's $5.4 billion acquisition of auto-parts maker Gates Global, according to Dealogic. PetSmart's stock suffered an 18% drop earlier this year, but the slide was arrested July 3 when activist investor Jana Partners began pressuring the company to put itself up for sale. Since then, shares have erased losses in a dramatic 30% rebound. 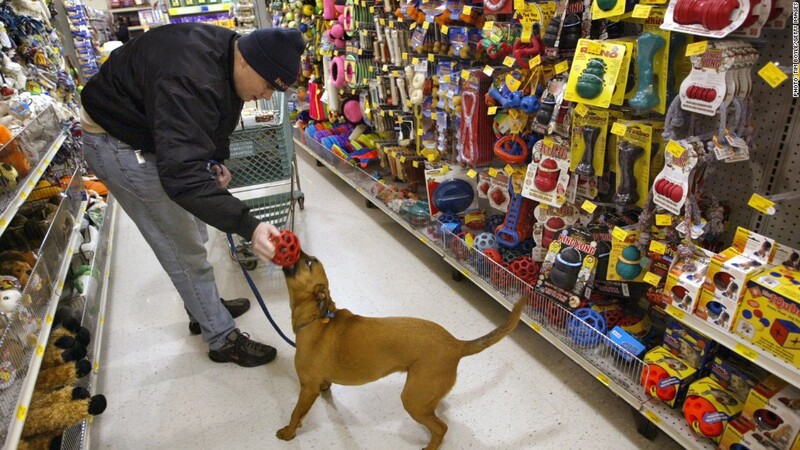 The pet supply retailer continues to face challenges, especially as shoppers move online. In the third quarter of this year, net sales were up by 2.6%, and the company's $92.2 million net income was flat compared to the same period last year. Looking ahead, PetSmart still doesn't expect much of a sales boost next year, but it will implement a plan introduced earlier this year to cut costs by $200 million. PetSmart executives and BC Partners said the cost-cutting initiative, and a larger strategic overhaul, will set the company up for future growth. PetSmart operates nearly 1,400 pet stores in North America, and offers a range of services including pet boarding, medical services, grooming, training and adoption. The U.S. pet industry is expected to hit a record $59 billion this year, according to the American Pet Products Association.